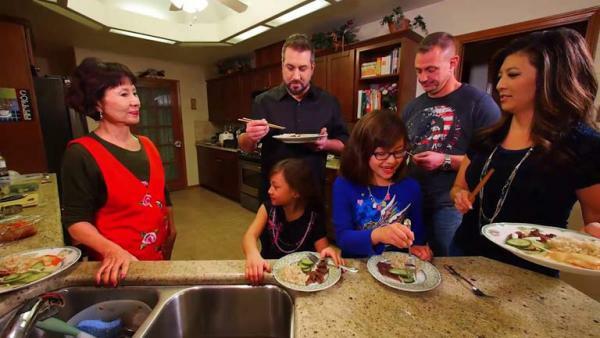 Joey Fatone cooks a traditional Korean meal with KFSN's news anchor Margot Kim at her home in Fresno, California. They make dumplings and Korean barbequed beef that is marinated in a delicious sauce with a secret family ingredient. Margot joined the ABC 30 Action News Team in October 2004 and is the co-anchor of Action News AM Live. "I think every journalist likes the fact that every day is different. On day you are interviewing the governor or the mayor and the next day you are interviewing just a regular person -- so it is that adrenal rush that you get to cover a different story every day," said Margot. They start the meal off by making Mondu -- a Korean style dumpling that can be boiled or fried. It can be eaten as an appetizer or added to your favorite soup. "Korean cuisine is special because it is very healthy. There are a lot of wholesome ingredients and everything is fresh, and homemade and when it finally gets on the table, it is worth the wait," said Margot. Margot stuffs her dumplings with pork, tofu, onion and bean sprouts. She serves them with a soy sauce for dipping. Next, they prepare the main dish -- Kalbi. It is a barbequed beef that is thinly sliced and marinated in a delicious Korean sauce. The cut of this meat is special because it is a spare rib that is cut lengthwise or flank style. Your butcher probably has these strips already cut but if not, ask them to cut into thin strips. "Korean barbequed beef is one of the most popular dishes for Koreans and non-Koreans. It is a succulent, melt-in-your-mouth dish. Most families have their own recipe for Kalbi," said Margot. The secret ingredient in Margot's Kalbi is her mother's homemade plum extract. While they wait for Margot's husband Jason to grill the meat, they have a traditional Korean cocktail -- Makgeolli which is an alcoholic drink made from a mixture of wheat and rice. It is served in a bowl. Margot's mom was an anchor and reporter in Korea. She is very proud that her daughter followed in her footsteps. "Since high school I always wanted to be a news anchor. I think I worked about two and a half years," said Sylvia Kim, Margot's mother. "I didn't push her to follow in my footsteps but she liked it." Margot's daughters -- Marissa and Makayla -- joined them in the kitchen to make cucumber salad. It is a quick and easy side dish. Margot's meal with delicious! It was made with a lot of love and honors those family traditions that make cooking like this so special. These delicious Korean dumplings called Mondu can be served as an appetizer or in your favorite soup. News anchor Margot Kim shares her family's recipe for Kalbi -- which is a Korean BBQ beef. It is marinated in a flavorful sauce. This cucumber salad is a light and refreshing side dish. Go behind the scenes as Joey Fatone joins Margot Kim in her kitchen for some traditional Korean food.